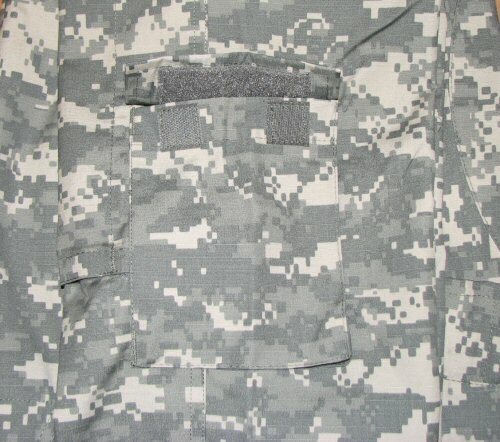 The Bulle NYCO ACU uniform is the next generation of military style uniforms. The uniforms are made of tougher NYCO ripstop material which is 50% cotton, 50% nylon. This is a machine-washable blend with quick-drying properties despite being medium to light-weight. 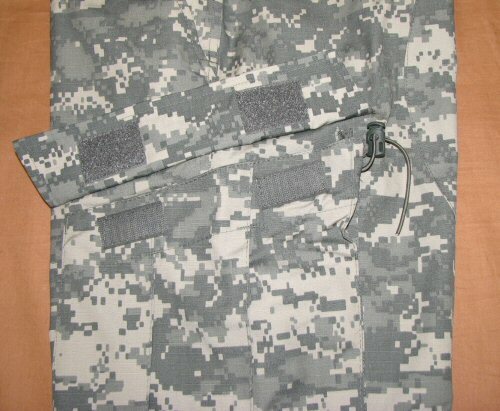 This material is the same type as used in the original issue ACU uniforms and is more colourfast, shrinkproof and wrinkle-resistant than the 100% cotton ACUs. 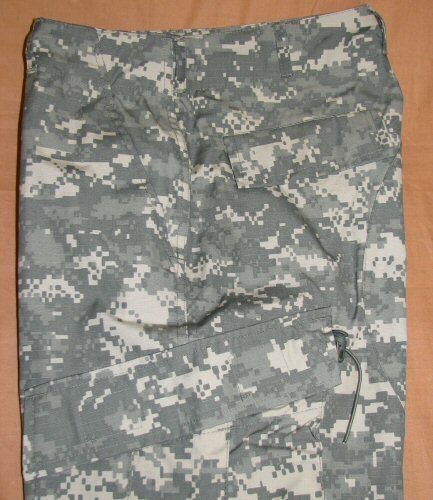 The ACU trousers were developed with direct input from US Army soldiers for comfort and ease of use under battlefield conditions. 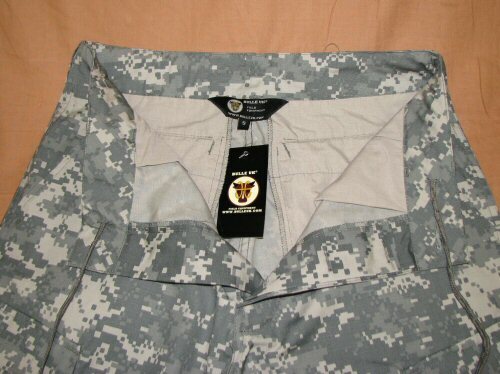 The Bulle ACU NYCO trousers have all of the following features: Drawstring and button waist, button fly, two rear button-down pockets, two slash hip pockets, two slanted leg pockets with expansion pleats, toggles on elastic shock cords for each leg pocket, small pockets on lower legs, knee patch reinforcements on each knee which open with velcro for padding, ankle drawstrings to allow for blousing of trousers. 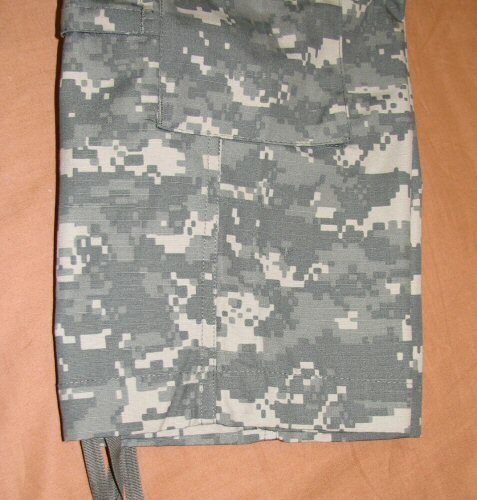 Belt loops are designed for standard 30mm wide trouser belts. Seat is reinforced with a large patch of material. Inner leg and seat to waist seams are double overlock stitch for durability. Crotch seam is triple stitched. 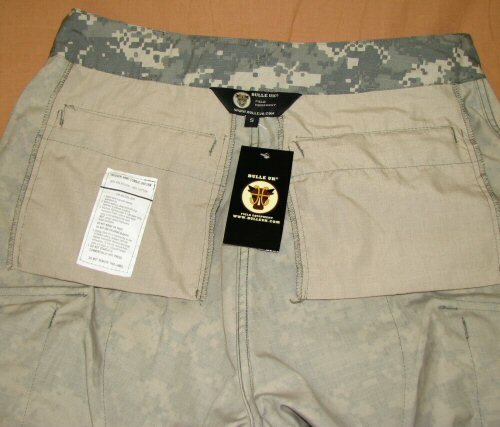 All details of the issue ACU trousers are included. The uniform IR signature is low when tested under low light, IR enhanced conditions. 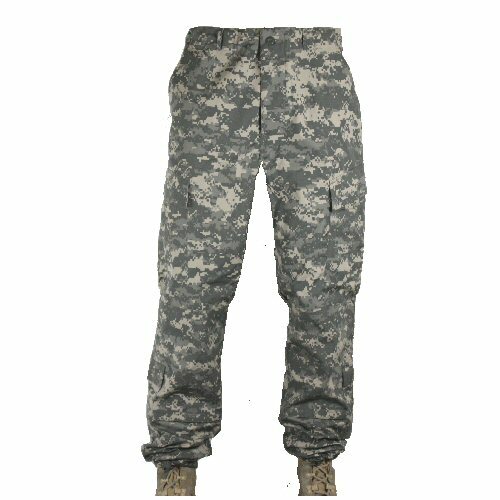 The Bulle NYCO ACU trousers are an excellent colour and pattern match for the original issue ACU uniform, and are the best value and most authentic brand of ACU trouser in this price range. Detailed view of the upper front, showing the drawstring waist. Detailed view of the button fly. Detailed view of the upper back, showing the two back pockets, seat reinforcement and the toggles at the rear of the slanted leg pockets. 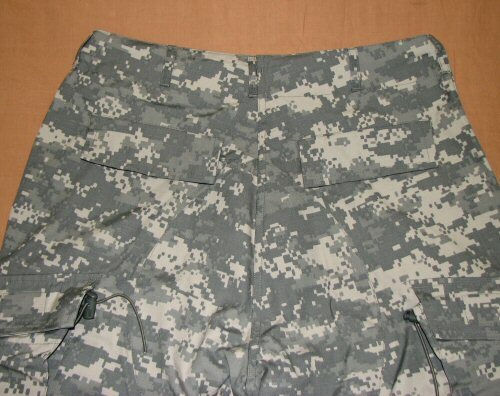 Side view of the trousers, showing a view of the top of the leg pockets and the toggle on elastic shock cord which is a feature on the original ACU trousers. 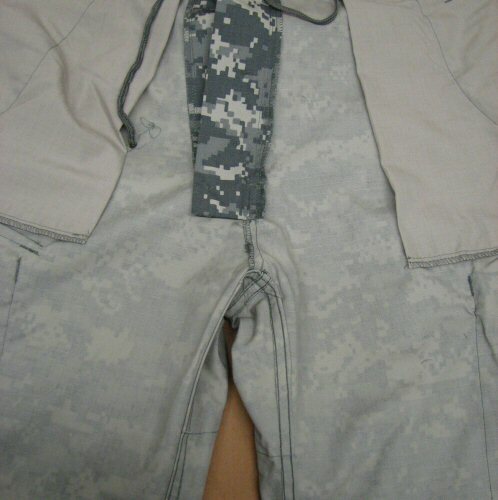 Detailed view of the leg pocket open, showing more detail on the elastic shock cord and toggle. Detailed view of the button closing flap for the back pocket. Detail of lower leg pocket. 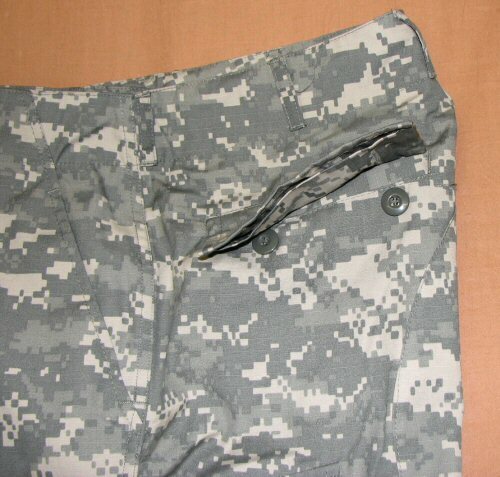 The lower leg pocket opened. Detailed view of the drawstrings on the ankle hems. Also visible is the lower part of the knee reinforcement which opens with velcro to accept padding. View of the trousers, inside out. 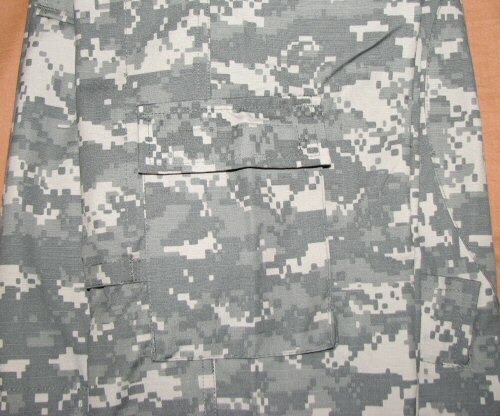 This shows the bar-tacking on the edges of the pocket flaps, and the double overlock stitching on the seams. 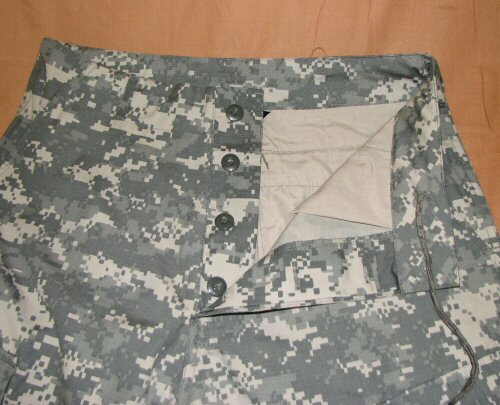 Back of the trousers, reversed, showing the bar-tack stitching on the pockets and pocket flaps, and the double overlock stitching on the main seam.